City officials announced Saturday that they have completed installing the first of several new restroom facilities in the downtown area to help combat the hepatitis A outbreak. 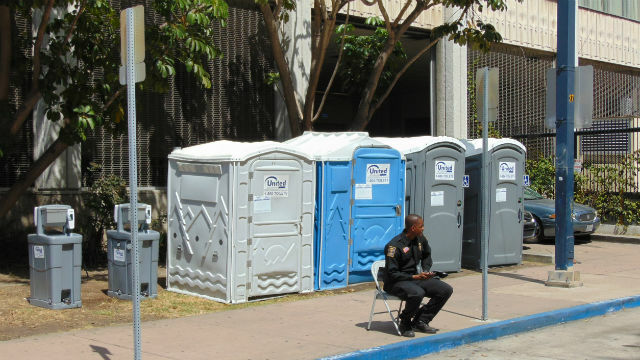 Four new portable restrooms were installed near the intersection of First Avenue and C Street near City Hall. They will be maintained at least twice per day and will be monitored with full-time security, according to a city press release. A hand-washing station is also available on-site. In what has been described as the largest outbreak of the virus in decades, 421 people have been infected with hepatitis A in San Diego County, and 16 of those have died. The outbreak began in November 2016, but was not identified until March 2017. The majority of those infected were either homeless or illicit drug users, health officials have previously said. As a result of the outbreak, the city has taken to washing downtown streets with bleach. The city is taking other steps to fight the outbreak, including plans to install 41 new hand-washing stations throughout downtown and identifying additional potential hand-washing and public restroom locations. Free hepatitis A vaccinations will be offered at city libraries, including a clinic at the Central Library on Tuesday from 2 to 5 p.m.
Mayor Kevin Faulconer also announced earlier this week that the city would erect three temporary “bridge” homeless shelters in the coming months, with each to offer 100 or more beds, showers, meals and supportive services to help people transition into permanent housing.